Disappointments – large and small – are inevitable parts of everyone’s daily lives. The way we handle, or cope with, those disappointments has an important impact on how we view ourselves and the world around us. Very young children don’t yet have the ability to manage their own emotional responses or stress. When they want something, they want it right away, and they let us know by crying or acting out. As children get older, they watch how adults cope with disappointment and begin to model their own responses after ours. As adults, we can teach young people a few simple steps to regulating their emotions in stressful situations. When a disappointment occurs, take a moment to recognize how you feel and acknowledge those feelings. Then have a plan for how to calm yourself, such as taking a deep breath, counting to three, and telling yourself to calm down. Lastly, take a few minutes to think of positive, proactive solutions. Focus on things you can control, and keep in mind we can’t really control what other people do. From time to time, explain to children how you have used these steps to handle frustration. 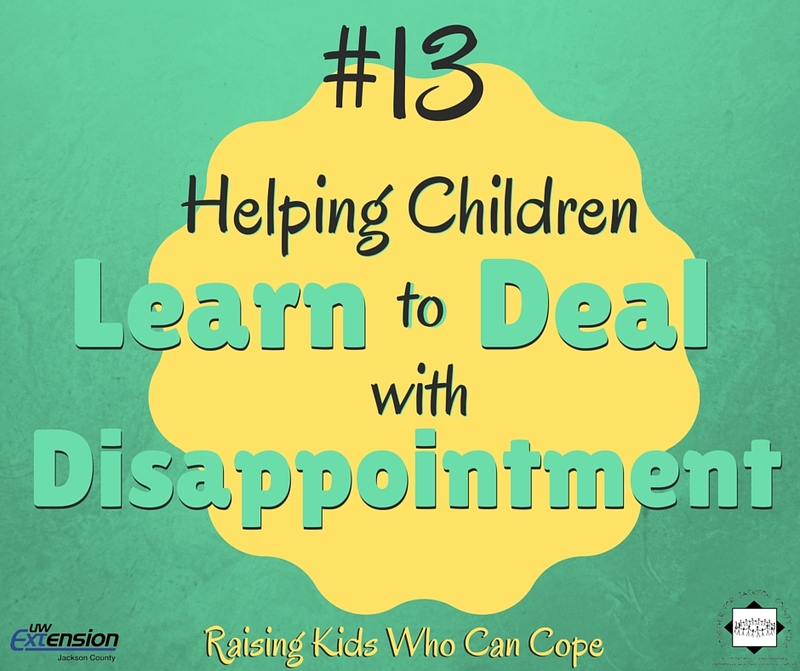 Then, when they experience disappointment, help talk them through the steps as well. With practice, their skills in coping with disappointment will improve, and they will become better problem solvers.